The Side Street Strutters are pleased to unveil an exciting new symphony POPS program designed for small chamber orchestras up to full size 70 piece professional symphony orchestras. The show offers 10 beautifully orchestrated arrangements encompassing a half century of American Jazz Classics. This powerful and entertaining presentation encompasses jazz styles from the New Orleans Dixieland and Blues sounds of Jelly Roll Morton and Louis Armstrong, popular jazz melodies of Porter and Carmichael, and exciting swing sounds of the big band era, featuring the music of Benny Goodman, Duke Ellington, Count Basie, and others. Celebrate the spirit and festiveness of New Orleans with this French Legionaires march. The ensemble parades from the rear of the performance venue to the stage while bringing to life the rich sights and sounds from the firthplace of jazz. The Strutters take you back to a time when straw hats, arms bands and raccoon coats were the fashion. This medley of Roaring 20s hits features singing, dancing, and audience participation. Jazz grew up in many cities throughout America, but the city of New Orleans is recognized as being the true birthplace of this indigenous American art form. Basin St. pays tribute to one of the many famous streets where jazz was first heard. The musical arrangement concludes with an old style “cutting contest” between the Strutters’ trombonist and trumpeter, who performs on the rare slide trumpet. Just A Closer Walk has been used for many years during funeral ceremonies. After leading the procession to the cemetery in a slow, dirge style, the band picks up the tempo as guests celebrate life. the treatment of this piece is full of lush writing for the orchestra. This fast tempo, high energy arrangement is jam-packed with humorous, entertaining antics. 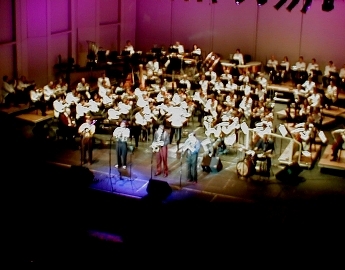 It is performed without orchestra but allows the conductor an opportunity to get involved in the fun. The orchestra plays off the band with an innovative reprise. The art of tap dancing is featured in this timeless swing selection. The orchestral arrangement allows your pops conductor to join in on the fun and tap dance as well. The great Duke Ellington wrote this classic ballad. It is so recognizable and well loved that it usually inspires singing from the audience. Prez Prado and his orchestra had a big hit with this popular 1950s trumpet feature. Before the selection begins, the audience is treated to a brief recording of the Strutters’ trumpet player performing this song when he was just five years old! The Strutters proudly pay tribute to the famous composer Hoagy Carmichael. This beautifully crafted orchestral arrangement features tight ensemble playing and four-part harmonies. Considered by some to be the greatest swing number of all time. Written by master showman and trumpeter, Louis Prima, this Benny Goodman classic always inspires a standing ovation. This traditional New Orleans spiritual is a great show closer. The Strutters invite the audience to clap and sing along. The orchestration allows for the option of strolling throughout the audience in the traditional spirit and festiveness of a New Orleans Mardi Gras, complete with bead tossing.